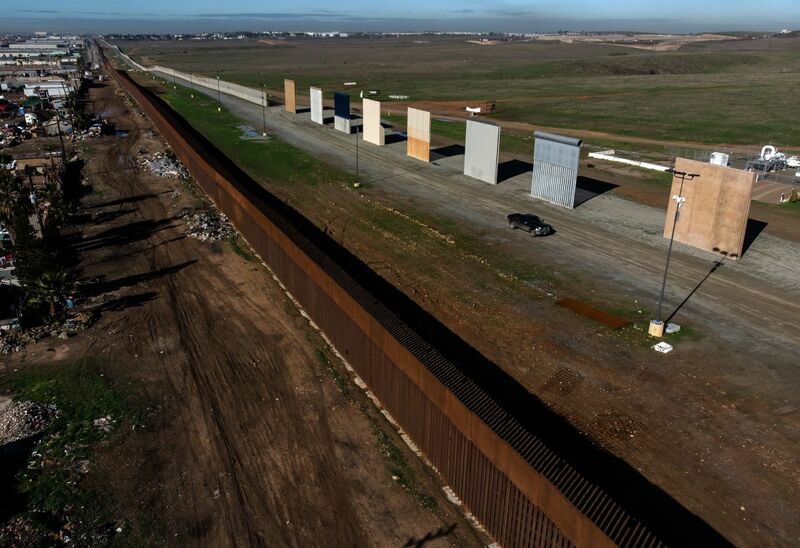 An aerial view of President Donald Trump&apos;s border wall prototypes as seen from Tijuana, in Baja California state, Mexico, on January 7th, 2019. On Tuesday evening, President Donald Trump will give a national address, aired on primetime television, "on the Humanitarian and National Security crisis on our Southern Border," as he announced in a tweet on Monday morning. Unlike other presidential addresses—for instance, President Barack Obama&apos;s announcement that United States forces had assassinated Osama bin Laden—Trump&apos;s address does not come in response to any specific news development. Rather, many see the address as an attempt to raise public relations pressure on Democrats in Congress as the federal government shutdown drags onward through its third week. 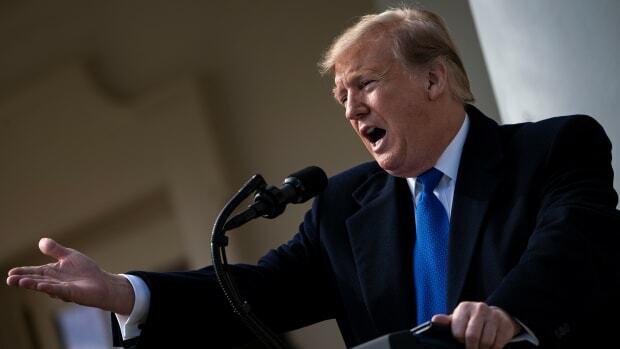 Trump has said he will not sign any funding bill to reopen the government unless Congress grants him over $5.7 billion in funds dedicated to building a wall—or, rather, some kind of barrier—along the U.S.–Mexico border. In his address, Trump will make his latest case for the construction of the wall by arguing that the situation on the border presents a crisis that threatens all Americans. The Trump camp, however, contends that this speech is not explicitly political, but rather a response to a very real "national security" crisis on the border. Along with drugs and illegal immigrants, the president (and his press secretary and the secretary of homeland security) have claimed that there are "terrorists" pouring across the border. Below, we look into the validity of this claim and others Trump has made about the situation along the border. Is There a "National Security and Humanitarian Crisis" on the Southern Border? It&apos;s complicated: While the U.S.–Mexico border frequently made news over the past year, particularly with regard to the administration&apos;s short-lived and controversial family separation policy, many see Trump&apos;s decision to make the address now as a response to the continued government shutdown, rather than any changing situation along the border. That said, there are two parts to this claim: the "humanitarian" crisis, and the "national security" crisis. Many advocates, both pro- and anti-immigration, will be quick to affirm that there is indeed a humanitarian crisis along the border. 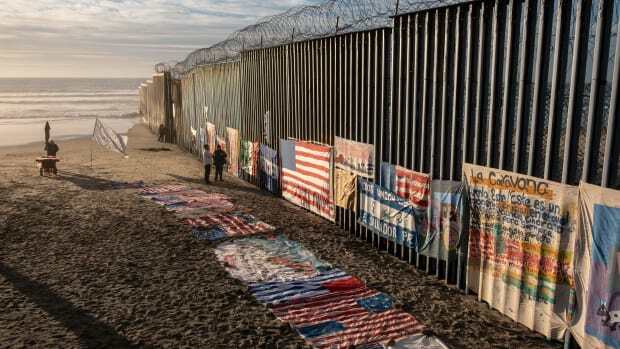 Though both legal and illegal border crossings continue to remain at levels dramatically lower than in recent decades, the number of family arrivals and the number of people asking for asylum has risen significantly in recent years. The country&apos;s immigration infrastructure has been woefully unprepared to handle both the families and the wave of asylum-seekers: Wait times for asylum claims have stretched out for months, causing migrant camps to form in Mexico and leading to pressure that could break out into violence. The death of two children in Customs and Border Patrol detention in December has sparked what some are calling a human rights crisis. 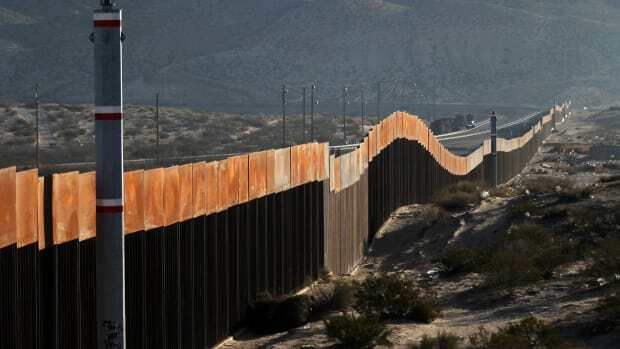 The idea that building a wall might address these issues is rooted in the Trump administration&apos;s belief in "deterrence": The argument is that building a wall will discourage migrants from traveling northward with their families. The next part of the claim—that there is a "national security" crisis on the border—is more controversial. When discussing national security, Trump has, in the past, focused on two main threats: terrorists and drug smugglers crossing the border. Are Terrorists Pouring Across the Southern Border? 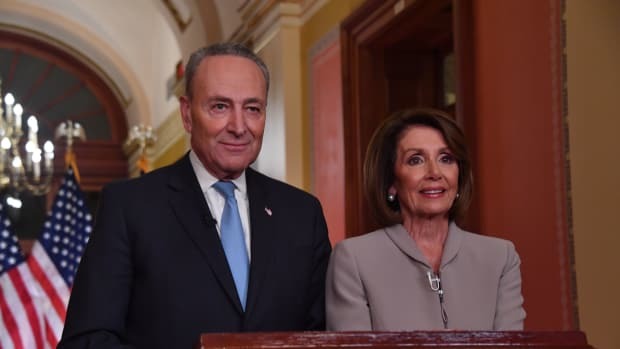 During his pre-shutdown Oval Office appearance with House Speaker Nancy Pelosi and Senate Minority Leader Chuck Schumer on December 11th, Trump claimed that "people are pouring into our country, including terrorists." Last week, White House Press Secretary Sarah Sanders claimed that CBP had detained over 4,000 "known or suspected terrorists" crossing the southern border in the fiscal year of 2018. The administration has provided no evidence to back up Trump&apos;s claim or Sanders&apos; number. In contrast to both remarks, Department of Homeland Security data obtained by NBC showed that only six people in any terrorism database had been stopped during that time period. The 4,000 number likely refers to "special interest aliens," the designation given to illegal immigrants who comes from "countries of interest"—namely, countries that have produced or exported a terrorist in the past. According to a study by the libertarian Cato Institute, Indians and Brazilians constituted the majority of these "special interest aliens" apprehended between 2007 and 2017. According to that study, no one has ever been killed by a terrorist who entered as an illegal border-crosser, and, from 1975 to 2017, the seven people convicted of planning a terrorist attack who entered the country illegally all either came across the Canadian border or arrived as stowaways. 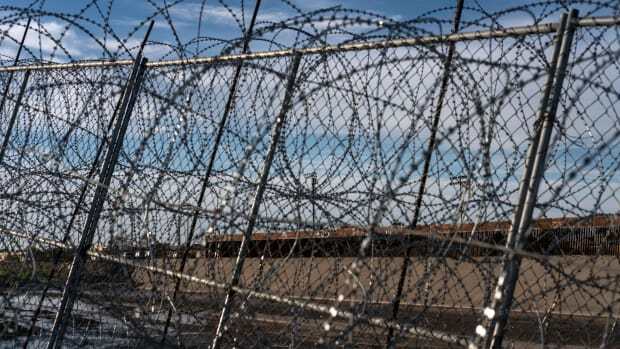 The study also found that no one who crossed the Mexican border as an adult has ever been convicted on a terror-related charge. In September, the Department of State released a summary of global terrorism threats from 2017 that found "no credible evidence indicating that international terrorist groups ... sent operatives via Mexico into the United States" in that year. Are Drugs Pouring Across the Southern Border? The short answer here is "yes": Huge quantities of drugs flow daily across the southern border into the U.S. As many experts have pointed out, however, a wall will likely do little to stem this tide for one simple reason: Drugs coming across the border are primarily transported by car through existing official checkpoints. The Drug Enforcement Administration wrote in 2015 that "[cartels] transport the bulk of their drugs over the Southwest border through ports of entry using passenger vehicles or tractor trailers." Other methods for circumventing existing walls and barriers include using tunnels to smuggle drugs underground or using catapults to launch drugs over walls. Is Mexico Going to Pay for the Wall? During his campaign, Trump famously pledged that Mexico would pay for the border wall. Now that he&apos;s pressuring Congress to provide funding for it in the form of 5.7 billion American taxpayer dollars, reporters have asked the president: What happened to the promise of Mexico&apos;s financial backing? 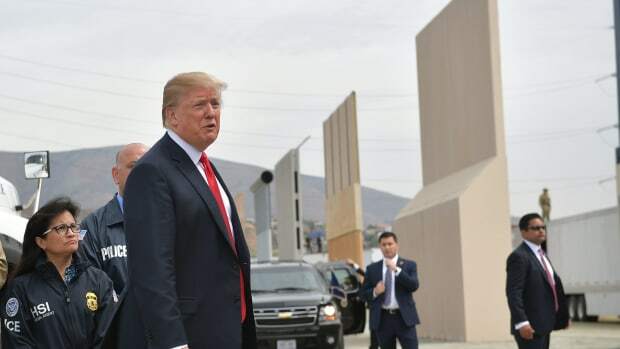 Trump has responded that, through his administration&apos;s negotiation of the successor to the North American Free Trade Agreement, Mexico will pay for the wall. But the trade agreement—which is yet to be ratified by Congress—contains no language committing Mexico to pay for any part of the wall. The president might mean that the trade agreement could fund the wall through increased tax revenue or economic growth. However, a New York Times fact-check cautioned that, even if such growth could offset the cost of the wall, it would be odd to characterize such an outcome as "Mexico paying for the wall." Do Most Furloughed Federal Employees Support the Wall? Trump has claimed that many federal government employees currently furloughed by the shutdown are happy to go without pay because of their strong support for his proposed border wall. Polling shows that over 70 percent of government employees oppose the shutdown, compared to 22 percent who support it. Among those in favor of the shutdown, nine out of 10 respondents said that their backing comes from their support for Trump&apos;s proposed wall.